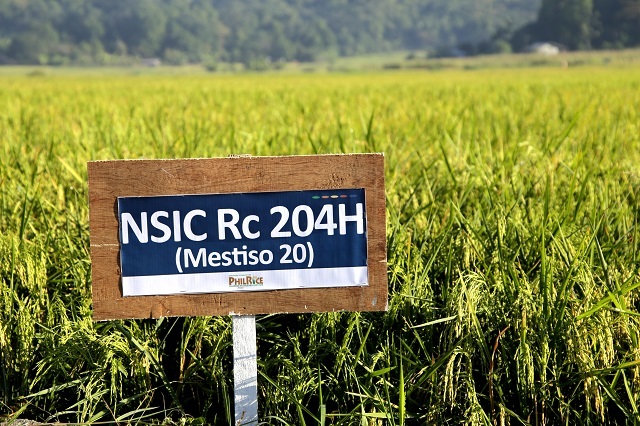 Mestiso 20 (NSIC Rc 204H), a public hybrid rice bred by the Philippine Rice Research Institute (PhilRice) and University of the Philippines in Los Banos, showed good performance in the technology demonstration farms in Region I. The “derby,” a venue for farmers to compare crop yield, stand, and resistance against pests and diseases, features 19 hybrid rice varieties in a 10 ha-farm. Mestiso 20, more popularly known as M20, has a yield of 6.4t to 11.7t/ha. It matures in 111 days after sowing, and is moderately resistant to yellow stem borer, green leafhopper, and brown plant hopper. On-farm data also show that hybrids yield higher than inbreds by a minimum of 15%. Based on the 2017 PhilRice’s policy brief, planting hybrid rice is one way to improve farmers’ competitiveness. This could increase yield and reduce production cost per kilogram of palay. Due to its high yield, hybrid rice can increase the availability of local supply, which strengthens the country’s rice security and minimizes the need to import. Meanwhile, Mestiso 20 was also included as one of the best hybrid rice varieties in the 8th National Rice Technology Forum in Asingan, Pangasinan. With the event’s theme “Increase Rice Productivity Through Rice Technology”, the hybrid rice varieties were established through direct seeding, and manual and mechanical transplanting. “We’re thankful for establishing a techno-demo field in our place. We can observe how the different hybrid rice varieties grow and perform, and have the chance to choose what variety best suits our area,”Amor Piso, a farmer in Asingan, said. M20, together with Mestizo 1, is being promoted by PhilRice’s Public Hybrid Rice Commercialization Program that aimed to intensify the promotion of public hybrid rice varieties through production of parental seeds and secure its availability to users. PhilRice is in-charge of producing parentals (parent seeds, such as nucleus, breeder, and foundation seeds) of M20 for seed growers. On the other hand, the seed growers across regions produce the F1 seeds needed by farmers to plant M20 in their fields. Farmers who are planning to try M20 are advised to contact the nearest Department of Agriculture offices in their provinces and/ or municipalities for inquiries regarding the seeds’ availability.